This design in every way reflected the title “Nurtured”. 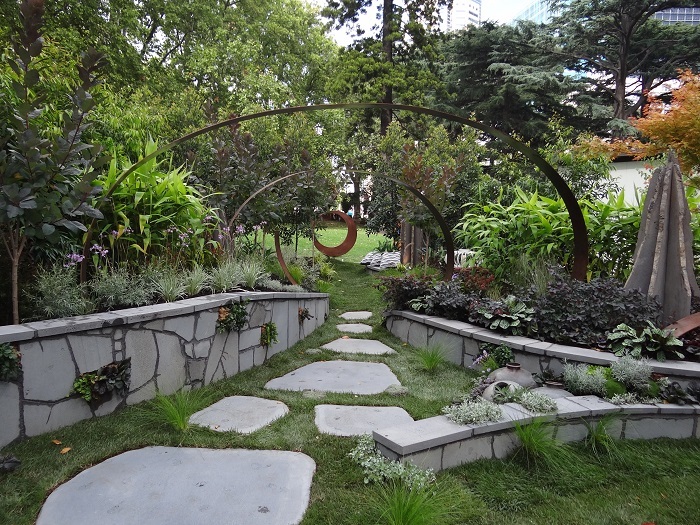 I spoke to a member of the landscaping team, Rob Wimmers, who likened the style to a “green nest” – the garden gives a wonderful feel of depth and perspective, with a meadow-style garden encompassed by a beautiful metal ribbon. This garden is a retreat, with soft relaxing colours and textures in both the stone and plant selection. I really liked the use of bluestone and the plants such as ajuga peeking through the cracks to soften the look. Foliage colour was highly used in this garden – including purples of the loropetalum, the variegated society garlic, and the very striking calathea. The real treat however was the coral bark maple with its gorgeous golden glow. One onlooker said that he felt “instantly calmed by this garden,” and I couldn’t agree more. The team at Urbaneco have created a beautiful hideaway, easy to be replicated at home, though creative use of colour, plant positioning, and all round flow.